Toodaloo Katie: Hooray for packages!!! So recently, I have been ordering many things online in preparation for my closet overhaul. The most exciting thing is that they are all arriving this week. So far I have received a pair of dark wash jeans from Faith 21 (which I have to return because they are too big, but the pants are nice and price is even nicer, so I would recommend them anyways) and 2 camisole tank tops (Purple and white) as well as a wicked polka dot head band. I also received my first purchase from ASOS curve. Being from Canada, I had never really explored the plus size fashion outside of the US, thinking that the shipping and handling would be too ludicrous to bare. As it turns out the entire purchase was actually cheaper than my average Torrid order. I have been pretty bored with Torrid lately, but I think it is because I have been ordering from them for so many years that I was starting to feel like it was repetitive. Nevertheless, they are still a fantastic company. 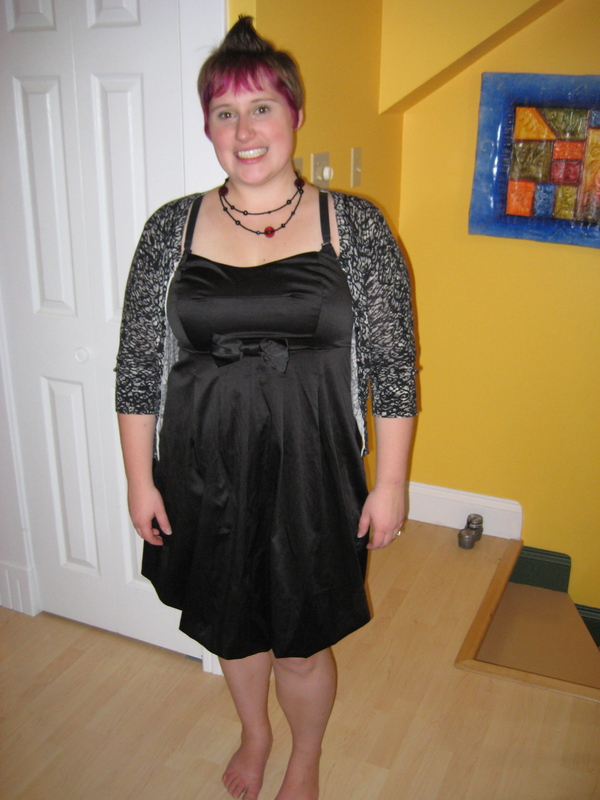 Here is a dress I purchased a few months ago from Torrid, but please excuse my bad posture. It is really comfortable and can be puffed out more in the bottom as it has a balloon hem. In my ASOS order I received a black boyfriend over sized tshirt and a pair of black skinny jeans. The shirt is a bit big, but as a plus I can wear it as a shirt dress with leggings and this fabulous new long cardigan that I got from Urban Behaviour this weekend. I also have 2 dresses from Alight which I am in love with, one Indian style print summer dress and one mini puff skirt tank dress. I know it's all hard to imagine so I will be taking photos just as soon as I finish work and my exam this week. I am also expecting a couple of things from Dorothy Perkins this week which I can hardly contain my excitement about. I will keep you posted, but this week is going to be one helluva closet buster! !